Adam Lamb Preschool offers a Christian based early childhood educational program for children 3 - 5 years of age. We use the Scripture Bites curriculum as a foundation for our thematic, center-based programming. Our teachers are degreed, and have experience working with preschool aged children. They are dedicated Christian professionals who wish to share their faith and educational training to provide a loving learning environment for your child. 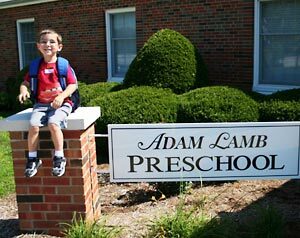 Adam Lamb Preschool has been part of the community since 1987. Call or e-mail Peggy Kanak, Director of Adam Lamb Preschool if your questions have not been answered by the information available on this website.